Every week we take a closer look at some of the best stoner films of all time and provide some random factoids about the cult favourites on the Grow series: Reefer Rewind. Time to grab your uppers, downers, screamers, and laughers. 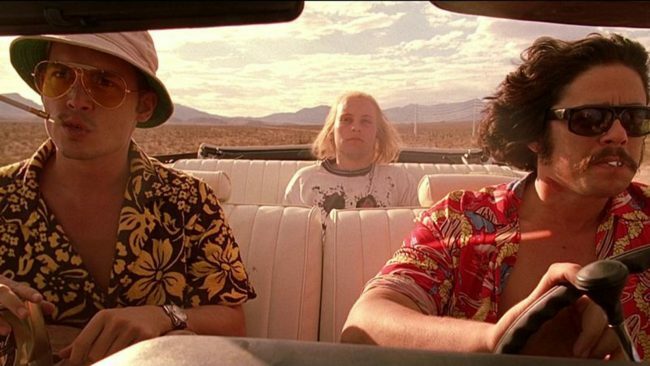 This week we are jumping into our convertible Cadillac Eldorado and heading towards bat country for the 1998 cult classic Fear and Loathing in Las Vegas. It’s only fitting considering this film just turned 20-years-old. 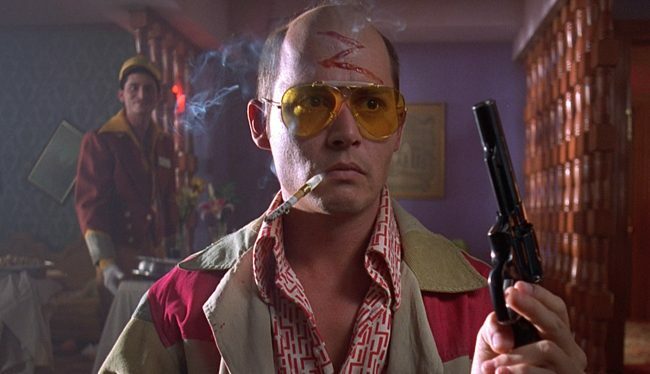 Fear and Loathing in Las Vegas was directed by Terry Gilliam and is based on the book by Hunter S. Thompson. The novel is a fictionalized account of two trips Thompson made with his friend Oscar Zeta Acosta from LA to Las Vegas. Two great actors—Johnny Depp and Benicio del Toro—star in the film, but there are many other notable faces you will see throughout like, Tobey McGuire, Ellen Barkin, Gary Busey, Christina Ricci, Mark Harmon, Cameron Diaz, and Harry Dean Stanton. The trippy flick follows Raoul Duke (Johnny Depp) and Dr. Gonzo (Benicio del Toro) on a drug-induced road trip to Las Vegas for an article Duke is writing on the Mint 400 motorcycle race. Like so many movies we will feature in this series, Fear and Loathing in Las Vegas bombed at the box office. The film grossed $10.6 million which was well below its budget of $18.5 million. Gilliam blamed the studio and complained that the marketing for the film made it look like a wacky comedy. What the film did end up doing was reignite interest in Thompson’s novel. When the movie was released, Vintage Press reprinted 100,000 copies of the book and demand was so high they had to reprint another 500,000 copies. 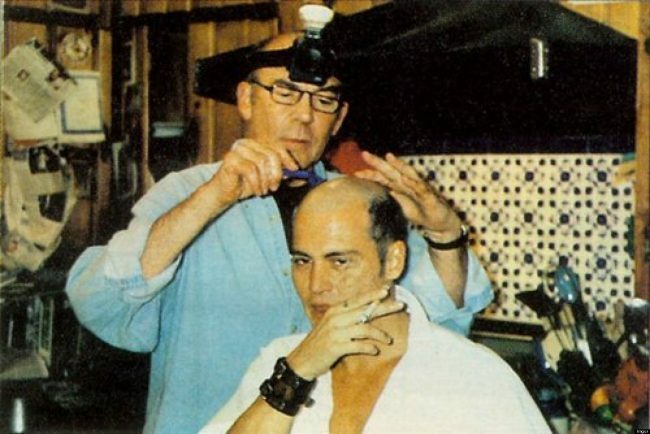 Depp and Thompson went on to become good friends and although the author approved of Johnny’s portrayal, he once said that if he ever saw anyone acting the way Depp does in the film, he would probably hit them with a chair. 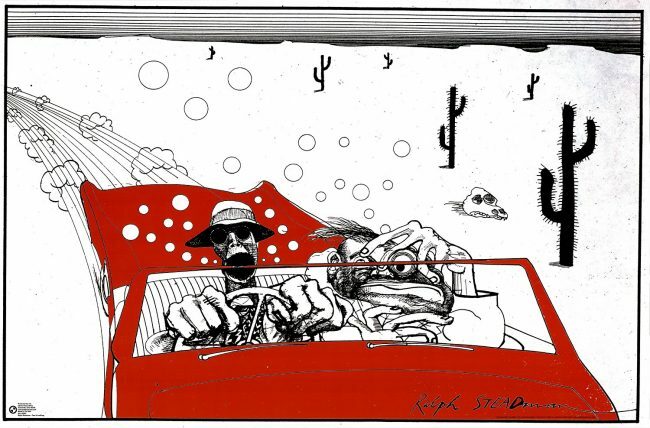 Ralph Steadman’s artwork for Fear and Loathing in Las Vegas by Hunter S. Thompson. Of course, you couldn’t have a Hunter S. Thompson film adaptation without including Ralph Steadman’s artwork (he created the font for the title of the film). The Welsh illustrator had a long time partnership with the American journalist and drew pictures for several of Thompson’s books and articles. In the part of the movie where Duke starts seeing bats and asks Gonzo to drive, you can see a strange looking cactus in the background. That odd-looking cactus was designed by Steadman and it actually appears many times in the background in various scenes. Call it a stoner Easter egg! Thanks to the great work of cinematographer Nicola Pecorini collaborating with Gilliam, the structure of the film mirrors the actual drugs that are consumed in the story. It has the initial euphoria followed by the long, slow downers of a trip. As a film, its technical side is impressive considering it worked off a modest budget. The visuals at times were extremely psychedelic with a nice mix of unusual colour palettes, practical effects, and digital manipulation. With everything currently going on in this mad, mad world, maybe it’s time to revisit Fear and Loathing in Las Vegas. I highly recommend grabbing the Criterion Blu-Ray edition as it has some commentary by Gilliam, Thompson, and Depp where you can get even more insight, including the time Depp and Thompson shot homemade bombs made up of propane tanks and nitroglycerin. Maybe it’s time to take a road trip down south.